As we move out of summer into the cooler months, we approach that time of year again: flu season. 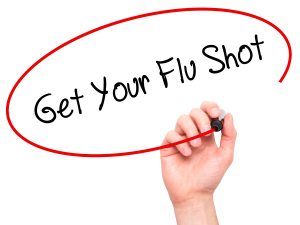 If you’re a business owner, make it a priority to ensure that your employees receive the influenza vaccine every year. Influenza (flu) is a highly contagious viral infection. It differs from a cold in that symptoms like fever, sore throat and muscle aches develop suddenly and last for about a week. Sometimes, it can lead to severe illness and complications such as pneumonia and bronchitis, which can result in hospitalisation and even death. The flu can also make some existing medical conditions worse. ● by direct contact with the virus on hard surfaces or on people’s hands. It spreads rapidly in indoor environments like offices but outdoor work environments can also be prone to outbreaks, when the virus becomes airborne or contaminates a surface that many people touch, like the handle of a tool. In Australia, flu infections are most likely to occur between May and September. ● people with underlying medical conditions. Because of this, some groups are able to be vaccinated for free under the National Immunisation Program. Why should I vaccinate my employees? Employees who contract flu are likely to need time off to recover, leading to missed deadlines and lower productivity. Because flu is highly contagious, ensuring that all of your employees are vaccinated minimises the risk of an outbreak in your workplace. Does it have to happen every year? ● there is now evidence that the effectiveness of the vaccine wanes over time, and it’s important be protected at the time of year when the flu is most prevalent. How do I ensure my employees are all vaccinated? The best way to guard against a flu outbreak amongst your employees is to have a flu vaccination initiative in place at work. At Family Doctors Plus, we provide a complete range of corporate and occupational health services to organisations in Brisbane and surrounds, including workplace vaccinations. Contact us today to discuss vaccinating your staff ahead of this year’s flu season.